Will 'Ambazonia' Become Africa's Newest Country? 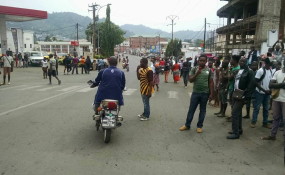 Riots in Limbe (file photo). Cape Town — On September 22, while President Paul Biya was attending the UN conference in Washington, massive protests across Cameroon's Anglophone regions brought thousands of people to the streets. It was one of the biggest protests the regime has seen in over three decades in power. But the fact that it went ahead despite the interdicts and curfews from government authorities should give the authorities a sense of the seriousness of the situation. The predominantly English-speaking southern Cameroonians feel they are being marginalized in their own country and believe they will be better off on their own - hence they have chosen Sunday, October 1, to declare an independent southern Cameroon. This will effectively bring an end to over 50 years of living together as a nation with the predominantly French-speaking east Cameroon. The highly centralized government have in the past used brutal force to crush any sign of protest. Events since November 2016 have proved that brute force is no longer effective, despite the killings and arrests the defiance continues. This reaction has been counterproductive, sparking pressure for dialogue from human rights organizations and the international community. Unfortunately, dialogue is not something the Biya government understands, so as October 1 approaches fear of bloodshed has gripped the country. Social media is awash with photos and videos of thousands of heavily armed uniformed men being transported to the two regions. Some are even fearing genocide - this cannot be brushed off as the divide and rule system practiced by the government for decades have over the years made conditions favorable for mass killings. Patriarchs from the presidents clan are seen on social media asking authorities for permission to arm themselves. Newspapers are reporting on uniform officers breaking down the doors of Anglophones residing in the capital for random searches. Moreover, the militarization of the region is making matters worse, prompting the UN to call for restraint come Sunday. The government must first and foremost take responsibility for the situation the country finds itself in. This has always been a bitter pill for a regime that has been over the years accustomed to blaming the victims. For starters, if the decentralization provided by the constitution over twenty years ago had been implemented it is very unlikely the country would be in this situation. Moreover if the government had listened to advice given to it when this all started in November 2016 the situation could probably have been averted. instead it labeled the reformers terrorists, engaged in mass arrests, shut down social media, etc - pouring petrol on an already burning flame. If Cameroon's leaders cannot climb down from their high horse this time there is bound to be bloodshed, and this will bring more pressure to bear. The government's next steps are crucial - at best, they will take a decision that will end their hold on power, or at worst lead to a replica of the situation in neighbouring Central African Republic. Secondly, the commendable restraint showed by the forces on November 22, 2016, must be replicated and people on the street must be guided to an assembly ground rather than be dispersed. Security forces must be briefed on Friday and Saturday on how to go about this, and serious disciplinary measures must be taken against any officer who uses excessive force. The focus should be on crowd control, rather the dispersal. No arrests should be made except in cases where a person is caught in a crime that is unrelated to the protest. Even in such cases, as far as possible minimal force should be used. As early as Monday, October 2, the day after the event, the government should announce a date for the start of a frank and open dialogue. This dialogue should involve mostly civil society and other eminent leaders with the exclusion of political parties. It will be useful to remember that this is a grassroots protest excluding politicians from inception. The talks should be geared at a roadmap for a new country that works for its citizens and not its former colonial masters, and the handful of people that have held the country to ransom for over half a century. Even more importantly it should be stressed there should be no taboo subject and no party or persons should try to set the agenda. Every aspect of governance must be open for re-examination. Michael Tantoh is a content editor at Allafrica.com. His opinions do not necessarily reflect the views of allAfrica Global Media.